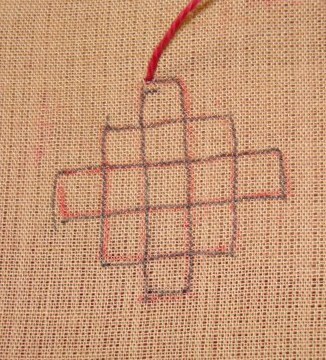 I had worked on a medium sized kutch work motif for a yoke, and wanted to share that motif on this blog, then I checked the motifs which I had posted earlier and found that, the simpler version of this motif was not posted at all. 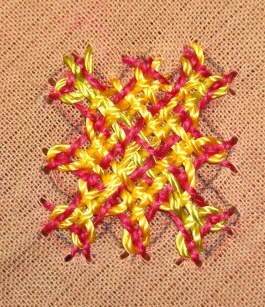 So in this tutorial, I am posting the simple woven motif. 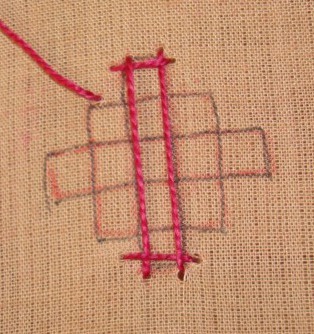 Completed basic stitch on bar. 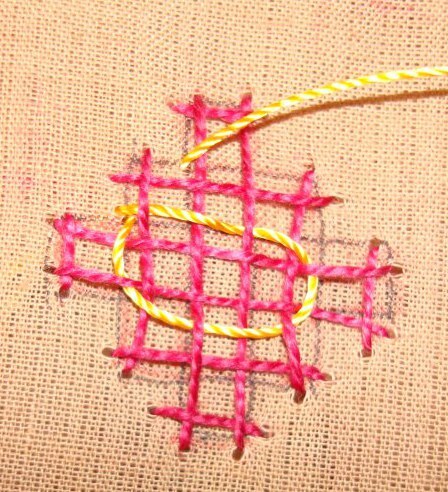 Whoever uses this tutorial would be knowing how to work the basic stitches. 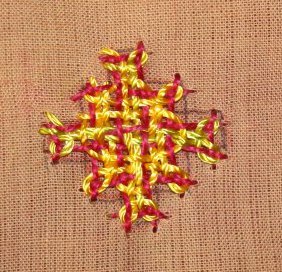 After working the first bar, the other basic stitches will go over or under alternatively to form a solid basic foundation, if there are any confusion, see the pictures and follow the steps and practice on them. 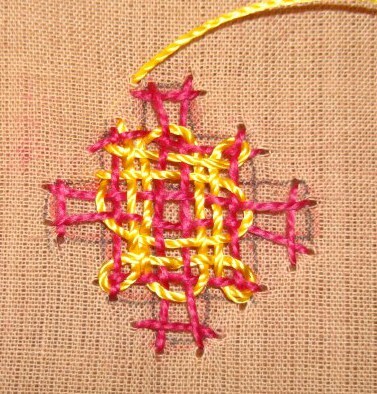 I used yellow variegated thread for interlacing. 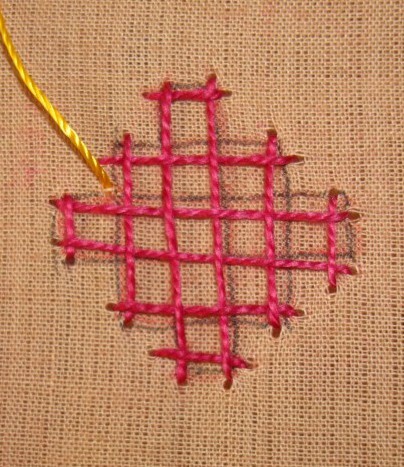 This motif also requires the extra[fourth line] to be worked separately, because the weaving thread does not flow automatically for the fourth line. The extra stitches are worked first. 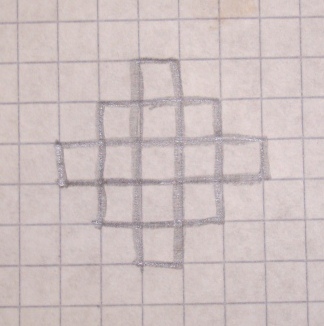 After finishing the first journey for the fourth line, starting the second journey of the fourth line, this is worked around the other bar. 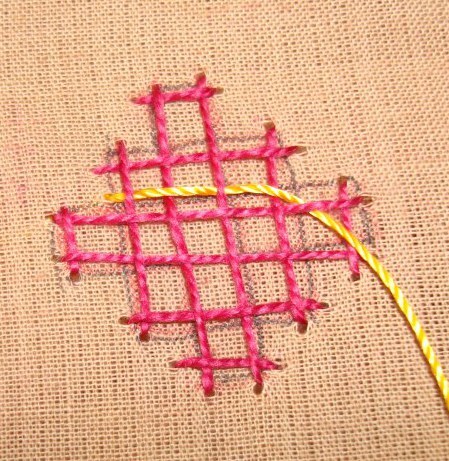 The corners of the outer square are worked and the weaving thread goes around the square weaving through the basic stitches, and the extra fourth line thread. 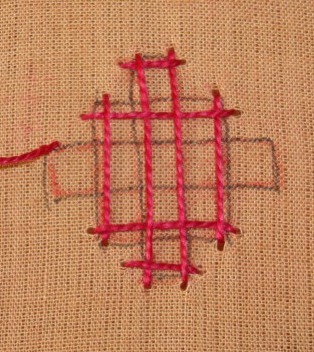 And we move on to weaving the two bars. 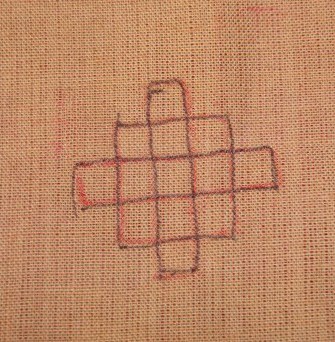 The first bar is woven. 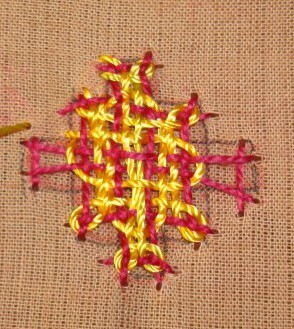 Moving on to the weaving of the other bar, the motif is completed. 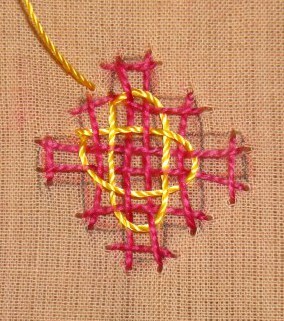 Hope this tutorial is easy and useful for all the kutchwork enthusiastics . if there are any questions or doubts, they can posted on the comments, I ‘ll try to answer them.